The Rt. Hon. the Earl of Carlisle, M.C. with Crane Kalman, London, where purchased by Mrs Prudence Loftus. 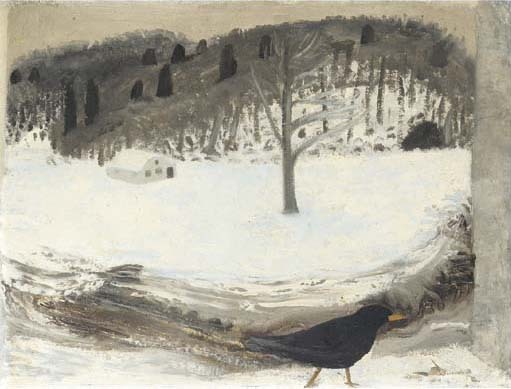 Kendal, Abbot Hall Art Gallery, A Tribute to Winifred Nicholson, November-December 1982, no. 34. Kendal, Abbot Hall Art Gallery, A Painter's Place, August 1991-July 1992, no. 8. London, Crane Kalman Gallery, The Rural Poetry of 3 English Women Artists, May-June 1992. In 1924 Winifred and Ben Nicholson set up home at Banks Head, a seventeenth century farmhouse in Cumberland. This was to remain Winifred's home for the rest of her life. To the south a their garden fell away to the valley of the river Irthing. The Nicholsons remained well informed of the latest developments in the art world and by 1926 Ben had become Chairman, and Winifred an important member of the advanced exhibiting group, the Seven and Five Society.